Silver (/ˈsɪlvər/ sil-vər) is a metallic chemical element with the chemical symbol Ag (Greek: άργυρος <árgyros>, Latin: argentum, both from the Indo-European root *arg- for “grey” or “shining”) and atomic number 47. A soft, white, lustrous transition metal, it has the highest electrical conductivity of any element and the highest thermal conductivity of any metal. The metal occurs naturally in its pure, free form (native silver), as an alloy with gold and other metals, and in minerals such as argentite andchlorargyrite. Most silver is produced as a byproduct of copper, gold, lead, and zinc refining. Silver has long been valued as a precious metal, and it is used as an investment, to make ornaments,jewelry, high-value tableware, utensils (hence the term silverware), and currency coins. Today, silver metal is also used in electrical contacts and conductors, in mirrors and in catalysis of chemical reactions. Its compounds are used in photographic film, and dilute silver nitrate solutions and other silver compounds are used as disinfectants and microbiocides (Oligodynamic effect). While many medicalantimicrobial uses of silver have been supplanted by antibiotics, further research into clinical potential continues. Silver has been used for thousands of years for ornaments and utensils, for trade, and as the basis for many monetary systems. Its value as a precious metal was long considered second only to gold. The word “silver” appears in Anglo-Saxon in various spellings such as seolfor and siolfor. A similar form is seen throughout the Germanic languages (compare Old High German silabar and silbir). The chemical symbol Ag is from the Latin for “silver”,argentum (compare Greek άργυρος, árgyros), from the Indo-European root *arg- meaning “white” or “shining”. Silver has been known since ancient times. Mentioned in the book of Genesis, slag heaps found in Asia Minor and on the islands of the Aegean Sea indicate silver was being separated from lead as early as the 4th millennium BC using surface mining. The stability of the Roman currency relied to a high degree on the supply of silver bullion, which Roman miners produced on a scale unparalleled before thediscovery of the New World. Reaching a peak production of 200 t per year, an estimated silver stock of 10,000 t circulated in the Roman economy in the middle of the second century AD, five to ten times larger than the combined amount of silver available to medieval Europe and the Caliphate around 800 AD.Financial officials of the Roman Empire worried about the loss of silver to pay for the greatly in demand silk fromSinica (China). In the Gospels, Jesus’ disciple Judas Iscariot is infamous for having taken a bribe of thirty coins of silver from religious leaders in Jerusalem to turn Jesus of Nazareth over to soldiers of the High Priest Caiaphas. The Chinese Empire during most of its history primarily used silver as a means of exchange. In the 19th century, the threat to the balance of payments of the United Kingdom from Chinese merchants demanding payment in silver in exchange for tea, silk, and porcelain led to the Opium War because Britain had to find a way to address the imbalance in the balance of payments, and they decided to do so by selling opium produced in their colony of British India to China. Recorded use of silver to prevent infection dates to ancient Greece and Rome; it was rediscovered in the Middle Ages, when it was used for several purposes, such as to disinfect water and food during storage, and also for the treatment of burns and wounds as wound dressing. In the 19th century, sailors on long ocean voyages would put silver coins in barrels of water and wine to keep the liquid potable. Pioneers in America used the same idea as they made their journey from coast to coast. Silver solutions were approved in the 1920s by the US Food and Drug Administration for use as antibacterial agents. In certain circumstances, Islam permits Muslim men to wear silver jewelry. Muhammad himself wore a silver signet ring. Argentina has jumped 55% in silver output in 2009 to 15.5% million ounces over the previous year. It produces 20.6 million of ounces silver. Only one mine at this time is in production and producing revenues. The pirquitas mine in Argentina. It produces 36.8 million of ounces silver. Russia‘s biggest silver producing regions are the Krasnoyarsk territory, Bashkortostan, Chelyabinsk region, Orenburg region Primorye territory. Over the past Russia was produce 60% silver. Now it produce 90% silver. The production of silver is 37.7 million in Poland. 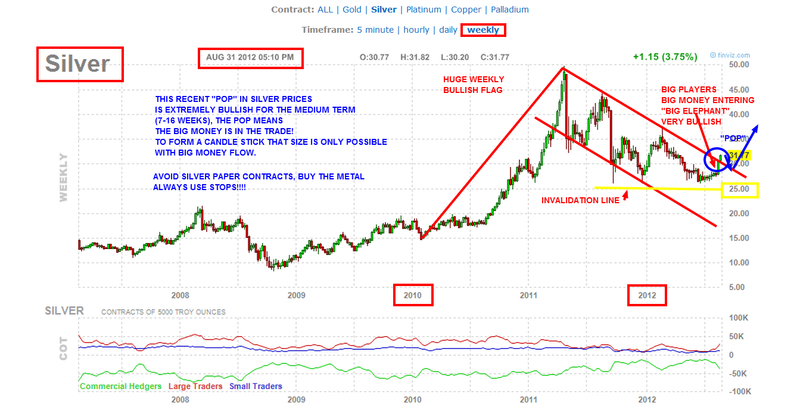 The production of silver increases in 2011 compared with their average production from 1998 to 2006 is 14.4%. The situation of Poland is close because a majority of the production is handled by a single mine. The United state is the major producers of the production silver in the world. In United State, silver produce 1,200 metric tons silver. 35% of the silver it used. The 65% is imported from Mexico, Canada, Peru and Chile. The production of silver in Bolivia is 41.0 million. San Cristobal is the top silver mine in Bolivia producing some 620,000 tons of the silver. San Cristobal mine is the third largest producers in the world. The productions of silver in Bolivia and in Chile are same. It also produces 41.0 million of ounces silver. It is very old silver production country and remains among the fifth number. Its production is 59.9 million ounces. It has the largest share of the world’s economic silver resources. 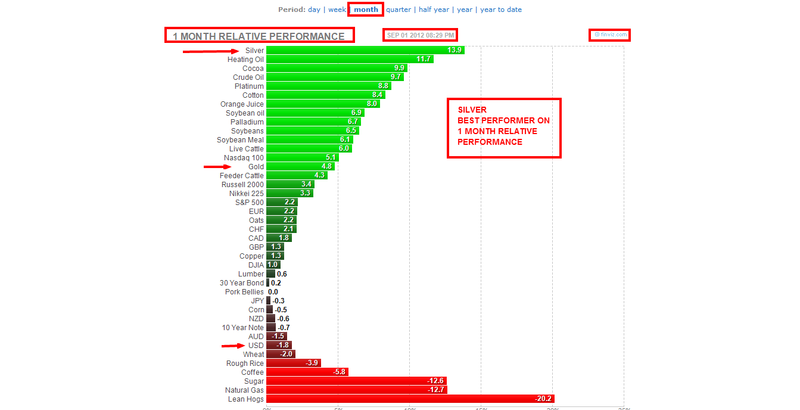 Australia’s silver production ranks after Mexico, Peru and the china. About 25% its mine output is refined to silver metal and sent to Japan. The production of silver in china is 99.2 million ounces. It supplies 29,000 tons silver to the world. The domestic price of China’s silver market is higher than international market price. The demand of silver in china is high. 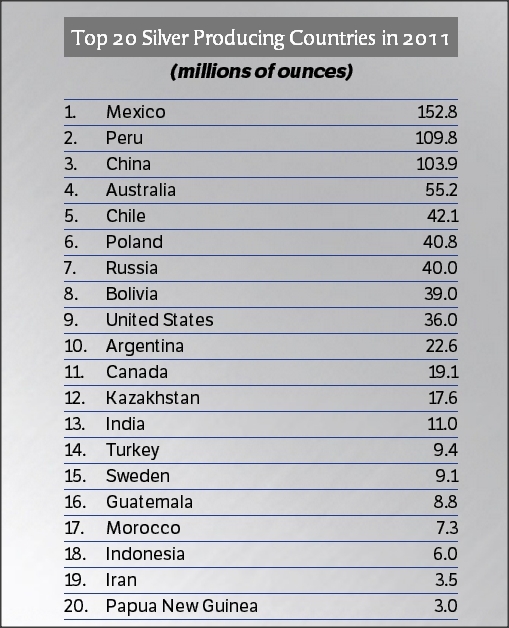 Mexico and Peru are the two pillars of silver production in the world. It produces 116.1 million ounces silver in Peru. In silver output, companies were more active and produce more than the last year. It exports about $479 million silver compared with $281 million in 2005. In the last 500 years, Mexico silver industry provided one-third of the world In Mexico, the production of silver is 128.6 million ounces. 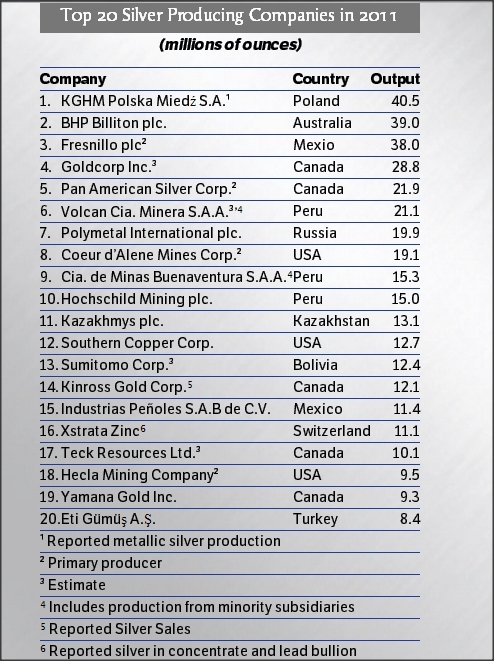 It has two of the top silver miners, industries Penoles and Grupo which together produce 66% silver. It is the pillar of world production of silver.